This article is about the television miniseries. For other uses, see 11-22-63. 11.22.63 is an American science fiction thriller miniseries based on the book 11/22/63 by Stephen King, and consisting of eight episodes. The series is executive-produced by J. J. Abrams, King, Bridget Carpenter and Bryan Burk, and produced by James Franco, who also has the main role. It premiered on Hulu on February 15, 2016, and was received positively by critics. Jake Epping (James Franco), a recently divorced English teacher from Maine, is presented with the chance to travel back in time to Dallas, Texas, in 1960 by his long-time friend Al Templeton (Chris Cooper). He is persuaded into going in an attempt to prevent the assassination of John F. Kennedy in November 1963; however, he becomes attached to the life he makes in the past which could be the mission's undoing. Cafe owner Al Templeton reveals a time portal to October 21, 1960 in his closet to his friend, English teacher Jake Epping. Dying of cancer, Al asks Jake to travel back to the 1960s and prevent the assassination of John F. Kennedy. Al explains his own past attempts and mistakes to Jake to stop it, noting his apparent onset of cancer was from spending extended time in the past. Armed with Al's research, Jake goes to 1960 and surveils a Kennedy intimate, believed to be Lee Harvey Oswald's handler. He finds that the past is "pushing back" as accidents and incidents make it difficult for him to achieve his goals. He returns to his lodgings to find them burning, Al's notes nearly all destroyed, and the landlady's son dead. He decides to give up, and "return to Maine", but stops to try and prevent a multiple murder he had heard about in the present. Jake starts a new life in 1960 and begins his investigation into the Kennedy assassination. He tests his ability to alter the past by attempting to prevent the murder of the family of one of his future students by their father, an abusive alcoholic who had previously killed the sister (and her baby) of Bill Turcotte, who discovers Jake is from the future. With the help of Bill Turcotte, Jake moves to Fort Worth and finds a job at a school in the nearby town of Jodie, where he forms a connection with a librarian, Sadie Dunhill. Jake and Bill surveil Lee Harvey Oswald, who has just returned from Russia. Oswald practices assembling his sniper rifle and takes the infamous picture with it. Jake and Bill follow Oswald and George to a brothel but things go wrong. Miss Mimi confronts Jake after discovering he's using a fake name, forcing Jake to make up a cover story. Sadie and Jake's relationship is tested by the return of Sadie's abusive ex-husband, Johnny Clayton, who refuses to finalize their divorce. Sadie discovers recordings of Oswald in the basement of Jake's house. Jake and Bill get ready to discover if Oswald acted alone in shooting General Walker. However, Time intervenes by distracting Bill with an illusion of his sister. Meanwhile, Johnny demands Jake come to Sadie's house where he holds both hostage with a gun after disfiguring her. Eventually, Jake and Sadie blind and then kill Johnny. Later at the hospital Jake decides to reveal to Sadie the whole truth about who he really is and where he's from. Jake discovers Bill has become intimately involved with Marina and has become Oswald's best friend. Bill reveals to Oswald that his apartment is under surveillance. Fearing Bill will become the second shooter, Jake has him committed. Time begins to push back by threatening Sadie's life during plastic surgery. After finding out that Oswald is acting alone and without CIA backing, Jake decides to kill Oswald. Before he can, he's attacked by his bookie and his thugs leaving him unable to remember anything. Jake wakes from his coma just days before the assassination date, suffering from amnesia. Sadie tries to help him as he struggles to remember what he needs to do. They visit Bill at the asylum in the hope that he will jog Jake's memory; however, addled by his treatment and Jake's insistence that time travel is real, Bill commits suicide. Jake relies on Sadie's help to recover his memory. Jake has full recall after a visit with Oswald in his house. During the events of November 22, 1963, Jake and Sadie struggle against the past on their way to the final confrontation with Oswald. Jake stops Oswald but during the scuffle, Sadie is killed. Jake travels back to 2016 only to find it has become a wasteland. Through Harry Dunning he learns that after JFK served two terms, George Wallace was elected president. War broke out and although Kennedy founded a series of refugee camps, there is great suffering in the world. A resigned Jake travels back to October 1960, thus resetting the timeline, where he immediately meets Sadie again, but decides not to pursue a relationship in order to save her life. In the present Jake travels back to Jodie and finds Sadie in her 80s receiving a prestigious lifetime achievement award for her life's work. Jake shares a dance with her. In August 2011, before the novel's release, it was announced that Jonathan Demme had attached himself to write, produce, and direct a film adaptation of 11/22/63 with King serving as executive producer. However, in December 2012, Demme announced that he had withdrawn from the project, after disagreeing with King over what to include in the script. On April 26, 2013, it was reported that Warner Bros. Television and J. J. Abrams' Bad Robot Productions were in negotiations for the rights to adapt the novel as a TV series or miniseries. On September 22, 2014, it was announced that a TV series based on the novel was picked up by Hulu. Carol Spier would be a production designer. The first trailer for the series was released on November 19, 2015. When asked about developing a sequel series, King stated “I’d love to revisit Jake and Sadie, and also revisit the rabbit hole that dumps people into the past, but sometimes it’s best not to go back for a second helping.”. James Franco was chosen to star as the character of Jake Epping. After reading the novel, Franco contacted King about the rights to adapt it to film only to be told that Abrams had already acquired them. Franco wrote an essay about the book for Vice, which was noticed by Abrams, and tweeted about his disappointment at not getting the film rights, which was noticed by Bridget Carpenter. Soon after, they offered him the lead role. Sarah Gadon was cast for the role of Sadie Dunhill. She was interested in the role in part because it gave her the opportunity to work with Abrams. Filming began on June 9, 2015, in Hespeler, Ontario. Filming during June 2015 also took place in Guelph, Ontario, as well as in Ayr, Ontario, at the Queen's Tavern, Hamilton, Ontario, and in Knowles Restaurant in Dunnville, Ontario during September 2015. In early October, the production moved to Dallas to film exterior locations at Dealey Plaza. During this time, the filming of various scenes during rush hour caused bumper to bumper traffic in the surrounding streets. The show has garnered positive reviews from most critics. Based on 51 reviews, the show carries an 80% "certified fresh" rating on review aggregator website Rotten Tomatoes where the consensus states: "Though the execution feels almost as dated as the period it represents, 11.22.63 gradually reveals a compelling, well-performed series of events." On Metacritic, the show has a rating of 69 out of 100, based on 35 reviews, signifying "generally positive reviews". Jack Moore of GQ commented that "the show is moody and supernatural, while somehow also remaining grounded and full of heart", and lauded Franco as the show's standout, saying "what Franco gives is a vanity-free, indulgence-free performance that feels like the work of an Old Hollywood legend. It's earnest and full-hearted." Alan Sepinwall also acclaimed Franco, stating "Franco's a revelation as Jake. He's an immensely talented actor and he's got the star quality you need to carry something this crazy, and this long." Vicki Hyman of the Newark Star-Ledger praised the performances of Franco and Gadon, writing: "Their stirring romance carries with it the same whiff of doom as Epping's visits to Dealey Plaza, and gives what could be merely an interesting and handsomely-made take on the conspiracy thriller genre more texture and depth, resonating across the ages." Hank Stuever of The Washington Post wrote that "King’s work doesn’t always happily travel through the portal connecting the page to the TV screen, but Hulu scores with an impressively stout-hearted, eight-part adaptation of 11/22/63." On the other hand, Jeff Jensen of Entertainment Weekly had a more mixed reaction and criticized Franco's performance, calling it "low-watt" and "disinterested". He wrote "11.22.63 reaches some thoughtful, moving conclusions, but oh, what could have been with a more engaged star. If only there were a time machine to fix that mistake." 11.22.63 was released on DVD and Blu-ray on August 9, 2016 in Region 1. The release includes all eight episodes, as well as a special feature titled "When the Future Fights Back", where King, Abrams, Carpenter and Franco talk about elements of the production that turned King's novel into an event series. 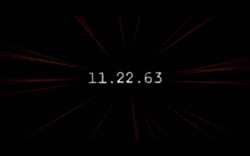 ^ a b "11.22.63 on Hulu Teaser Trailer (Official)". YouTube. Hulu. November 19, 2015. Retrieved November 20, 2015. ^ "Hulu Original "11.22.63" Premieres Presidents Day 2016". The Futon Critic. October 30, 2015. Retrieved November 17, 2015. ^ a b Lovett, Jamie (February 12, 2015). "James Franco To Star In Stephen King's 11/22/63 On Hulu". Comicbook.com. Retrieved February 12, 2015. ^ "11/22/63 - Now Available - Hulu Original Series Coming Soon". StephenKing.com. Retrieved 2016-04-09. ^ a b c d e f g h Pedersen, Erik (April 7, 2015). "Chris Cooper & Others Join Hulu's '11/22/63' Cast; Director Set". Deadline Hollywood. Retrieved November 17, 2015. ^ Lowry, Brian (January 28, 2016). "'11.22.63' Brings Stephen King Bestseller to Hulu as Eight-Part Event - Variety". Variety. Retrieved February 10, 2016. ^ Spangler, Todd (May 18, 2015). "T.R. Knight Joins Hulu '11/22/63' Event Series from J.J. Abrams". Variety. Retrieved February 10, 2016. ^ Goldberg, Lesley (July 27, 2015). "Josh Duhamel Boards Hulu's '11/22/63' (Exclusive)". The Hollywood Reporter. Retrieved November 17, 2015. ^ Petski, Denise (April 24, 2015). "Brooklyn Sudano Cast In 11/22/63 On Hulu". Deadline Hollywood. Retrieved February 10, 2016. ^ Rockingham, Graham (February 12, 2016). "The Kennedy Assassination Time Travel and Ancaster". Hamilton Spectator. Retrieved July 13, 2016. ^ Valby, Karen (August 12, 2011). "Jonathan Demme to adapt Stephen King's time-travel saga". Entertainment Weekly. Retrieved November 10, 2011. ^ Jagernauth, Kevin (December 6, 2012). "Exclusive: Jonathan Demme Exits Stephen King Adaptation '11/22/63'". Indiewire. Archived from the original on 2016-02-22. Retrieved February 10, 2016. ^ Andreeva, Nellie (April 26, 2013). "J.J. Abrams' Bad Robot To Option Stephen King Novel '11/22/63' For TV Series". Deadline Hollywood. Retrieved April 26, 2013. ^ Hibberd, James (September 22, 2014). "Stephen King's JFK assassination thriller gets Hulu series order". Entertainment Weekly. Retrieved February 10, 2016. ^ Caranicas, Peter (November 26, 2014). "Below the Line Bookings". Variety. Retrieved November 26, 2014. ^ Calvario, Liz; Calvario, Liz (16 April 2016). "'11.22.63' Sequel Series: Stephen King Reveals Potential Plans For Another Jake Epping Adventure". ^ Greene, Andy (February 8, 2016). "How Hulu Brought Stephen King's '11.22.63' to TV". Rolling Stone. ^ Fernandez, Maria Elena (February 12, 2016). "Bridget Carpenter on Adapting Stephen King's 11.22.63 and Why James Franco Was Cast". Vulture. ^ Simon, Rachel (December 4, 2015). "Sarah Gadon On Why Movies About Teen Girls Need To Try Harder". Bustle. Retrieved February 10, 2016. ^ Hicks, Jeff (June 9, 2015). "Actor James Franco in Hespeler for miniseries shoot". The Record.com. Retrieved June 10, 2015. ^ "James Franco film set crashed by meth-toting man on motorized bike". CBC News. June 18, 2015. Retrieved February 10, 2016. ^ Dowell, Arlene (June 4, 2015). "Franco filming mini-series in Ayr". 570 News. Retrieved February 10, 2016. ^ Wilonsky, Robert (October 5, 2015). "Dallas police delay downtown street closures till 9 a.m. for '11/22/63' filming in Dealey Plaza". The Dallas Morning News. Archived from the original on February 16, 2016. Retrieved February 10, 2016. ^ Chow, Kat (October 6, 2015). "Filming In Dealey Plaza Snarls Downtown Dallas Traffic". KERA News. Retrieved November 23, 2015. ^ "11.22.63: Season 1". Rotten Tomatoes. 8 November 2018. ^ Moore, Jack. "11.22.63 and the Welcome Return of James Franco the Actor". GQ. ^ Sepinwall, Alan (February 12, 2016). "Review: James Franco shines in Hulu's uneven time travel miniseries 11.22.63". HitFix. Retrieved November 12, 2017. ^ Hyman, Vicki. "11.22.63 review: Let's do the time warp again (and again)". Newark Star-Ledger. Retrieved 8 March 2016. ^ Stuever, Hank. "What Hulu's absorbing 11/22/63 tells us of the harm of dwelling in the past". The Washington Post. Retrieved 8 March 2016. ^ Jensen, Jeff (February 11, 2016). "11.22.63: EW review". Entertainment Weekly. Retrieved November 12, 2017. ^ Labert, David (April 26, 2016). "11.22.63 (mini-series) - James Franco Stars in the EXCEPTIONAL Mini-Series from J.J. Abrams and Stephen King". Archived from the original on April 28, 2016. Retrieved April 27, 2016.